Did you know that over 13 million Americans play soccer? The game that Brazilian 'football' legend Pele called The Beautiful Game is the setting for this amazingly entertaining musical that not only celebrates the beauty and glory of the sport, but also the value of good sportsmanship, setting goals, being a part of a team and more. 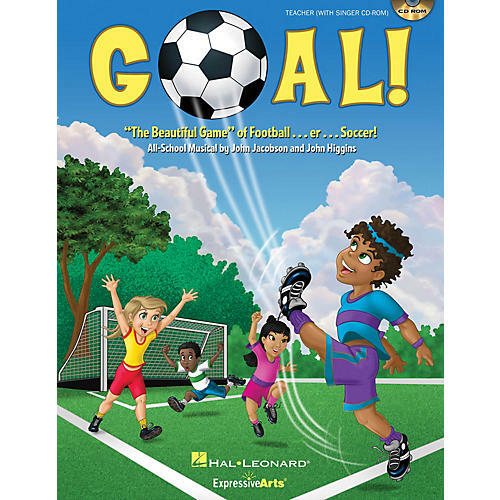 GOAL is a musical that every cast member will love to perform, whether sports is their 'thing' or not. In this musical, nobody is cut from the team, and with musical styles from Latin to Rap and Pop to Broadway, we celebrate setting goals and working as a team to accomplish amazing things together! This ALL-SCHOOL 25-minute musical features five original songs and script with over 30 speaking parts. The ENHANCED Teacher Edition includes piano/vocal arrangements with choreography, helpful production guide with staging and costume suggestions, PLUS an enclosed CD-ROM with reproducible singer and speaking parts. Suggested for Grades 1-5. 25 minutes.